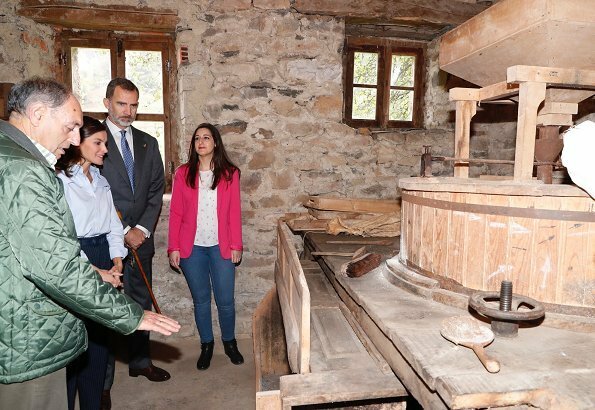 King Felipe VI of Spain and Queen Letizia of Spain visited Moal village (Cangas de Narcea) in Asturias state in the north of Spain. Moal village won 2018 Exemplary Town of Asturias award. Moal Town won that award because of living with the awareness of protecting the natural environment and their local efforts to use natural resources. 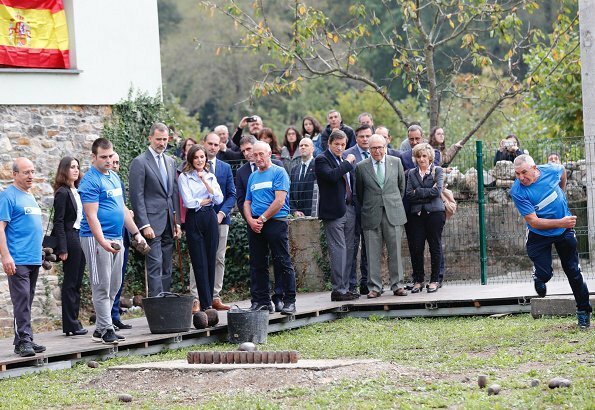 The Region of Moal was honoured as the 2018 Best Asturian Village. Nice outfit for this outdoor event.But the shoes are horrible, please change them out fast. Love her casual look-her earrings(butterflies)are amazing! Horrible trousers and shoes, but great coat and relaxed style. Nice from the waist up, but the waist down is just not good at all. Trousers and flats are certainly appropriate, but not these pieces. Muy urbana para el campo. For those who don't like her trousers and shoes, I dare say you are not from Europe, these pieces are very on trend right now and I think she looks lovely on the navy colour, very chic and stylish at the same time. Also the outfit still looks comfortable for this event. Agreed! I think there's a shift between what is considered royal dressing. These women are modern queens and princesses and dress with the times. Clean lines relaxed when the event allows...recycling of pieces. On other posts I see these type of outfits disparaged quite often. Kate is probably the only one who dresses quite close to older times and daresay I think it ages her horribly. But those outfits are considered lovely by many. I think there are different generations commenting and we'll just have to agree to disagree. And that's ok! Agree! Oxford shoes are trendy, classy and comfortable. I am not a fan of the trousers but the shoes, (trainers style) are OK and matching the rest. Als zo mager bent mag elke broekmodel of schoen of allerlei. Adoro los zapatos Oxford, son los más cómodos que tengo. 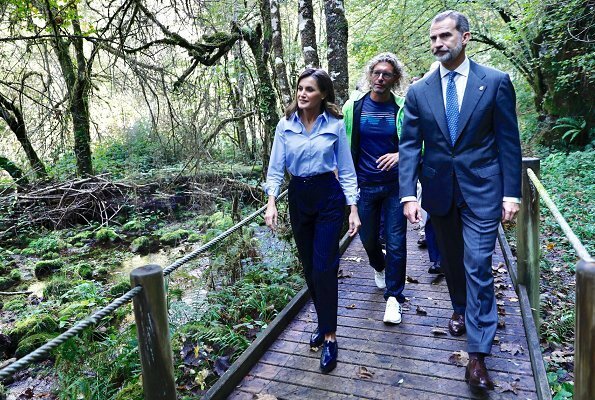 Una imagen relajada y cómoda de Letizia, adecuada para la aldea y el bosque, todo lo contrario al magnífico traje de la Gala del día anterior. Perfecta siempre. There was such a carefree, simple beauty about this look. Can’t pinpoint what made me love it. 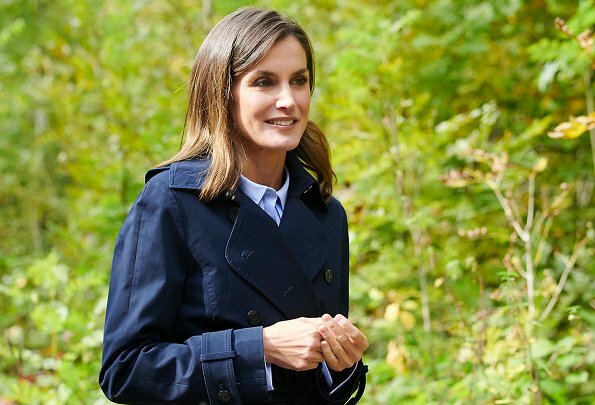 Letizia is amazing at polished perfection but this look, with its imperfections kind of looks really good. I love those oxfords! So chic. The navy trench is fab as well. It is nice to see it in another color. I want to see Felipe dress more casually in settings like this as much as I want to see Prince Daniel lose his double-breasted jackets. The king has to project a certain image so its unlikely that he will go casual. They are really representing the Princess until she takes over. Mom can relax a bit because she is not the 'holder'. Prince Daniel without his glasses and db jackets would be a different person.